The Universal Relay family of protection and control products are built on a common modular platform. All UR products feature high performance protection, expandable I/O, integrated monitoring and metering, high-speed communications, and extensive programming and configuration capabilities. The UR is the basis of simplified power management for the protection of critical assets. Up to 24 analog current transformer (CT) and voltage transformer (VT) signals can be configured to monitor AC power lines. Both 1 A and 5 A CTs are supported. Special function modules are available including: a CT module with sensitive ground input to provide ground fault protection on high-impedance grounded systems; and a high impedance fault detection module that provides fast and reliable detection of faults caused by downed conductors. Up to 120 digital inputs (with utility voltage rating up to 250V), and up to 72 digital outputs, are available and can be used to monitor and control a wide range of auxiliary equipment found within a substation or other protection application. Types of digital I/O cards include trip-rated Form-A, Form-C, Fast Form-C, Latching and Solid State with or without DC voltage, current monitoring and isolated inputs (with auto burnish feature). Mechanically latching outputs can be used to develop secure interlocking applications and replace mechanical switches and lockout relays. Form-A digital outputs have activation speeds of less than 4ms and both wet and dry contacts are supported. Solid state output modules with high current breaking capability, fast tripping and reset time are ideal for direct tripping applications. RTDs and DCmA cards are available to monitor system parameters such as temperature, vibration, pressure, wind speed, and flow. 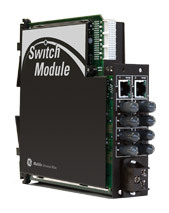 Analog outputs can be used for hardwired connections from the controller to a SCADA system, to a programmable logic controller (PLC), or to other users. 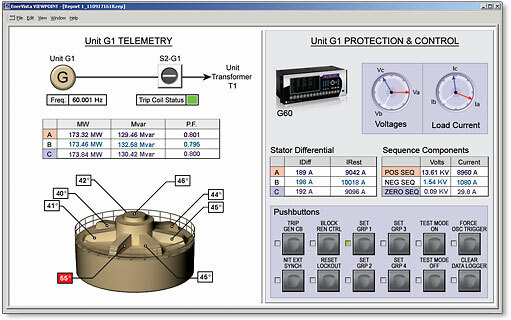 The UR is the single point for protection, control, metering, and monitoring in one integrated device that can easily be connected directly into DCS or SCADA monitoring and control systems like Viewpoint Monitoring as shown. The UR includes high accuracy metering and recording for all AC signals. Voltage, current, and power metering are built into the relay as a standard feature. Current and voltage parameters are available as total RMS magnitude, and as fundamental frequency magnitude and angle. Digital fault recorder summary with the latest information on the events, faults, transients and disturbances. Control screen for the preconfigured bay with breaker & disconnect control in multiple pages using dedicated pushbuttons in the front panel. The UR incorporates advanced automation features including powerful FlexLogic™ programmable logic, communication, and SCADA capabilities that far surpass what is found in the average protection relay. Each UR can be seamlessly integrated with other UR relays for complete system protection and control. FlexLogic allows for the creation of customized logic schemes to fit most protection and control applications. The UR provides advanced communications technologies for remote data and engineering access, making it easy and flexible to use and integrate into new and existing infrastructures. Direct support for fiber optic Ethernet provides high-bandwidth communications allowing for low-latency controls and high-speed file transfers of relay fault and event record information. The available three independent and redundant Ethernet options provide the means to create fault tolerant communication architectures in an easy, cost-effective manner. The UR supports the most popular industry standard protocols enabling easy, direct integration into DCS and SCADA systems. Intended for large substations having complex-split busbar schemes, the B90 is an advanced low-impedance differential protection system. The B30 is a cost effective-advanced protection system that fits busbars with up to 06 circuits and two protection zones. The B30 provides advanced elements that make the B30 and extremely fast and secure protection system. Provides comprehensive primary and backup protection for medium and large generators. Including/covering 100% stator and rotor (field) ground fault detection. Flexible system that can be used on small and medium generators, generator and step-up transformer arrangements or backup protection of large generators. A fully featured transformer protection system suitable for power transformers of any size that require current differential function. Basic transformer protection system capable of protecting combined main power transformers and up to five feeders downstream. The ideal solution for providing reliable and secure primary and backup protection of transmission lines. The cost-effective choice for the primary protection of sub-transmission systems or backup protection of transmission systems. Line protection system with segregated line current differential and complete distance protection. Extremely fast line phase comparison system, suitable for two or three-terminal transmission lines. A cost-effective phase segregated line current differential system, intended to provide primary protection for MV cables and two-three terminal sub-transmission lines or backup protection to transmission lines. An integrated protection, control, and monitoring device for shunt capacitor banks. The C60 is a substation hardened controller that provides a complete integrated package for the protection, control, and monitoring of circuit breakers, supporting dual-breaker busbar configurations, such as breaker-and-half or ring bus schemes. 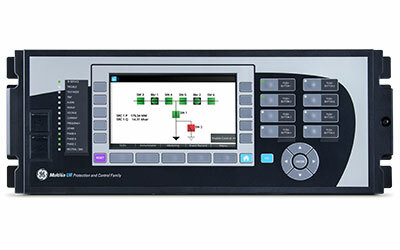 The C30 is designed to perform substation control logic that can also expand the I/O capability of protection devices and replace existing Sequence of Events (SOE) recorders. Comprehensive feeder protection, control, advanced communications, monitoring and metering in an integrated, economical, compact package and more. Comprehensive protection and control solutions for medium to large-sized three-phase motors. This network stability and synchrophasor measurement system is intended to be used on load shedding, remedial action, special protection and wide area monitoring and control schemes.